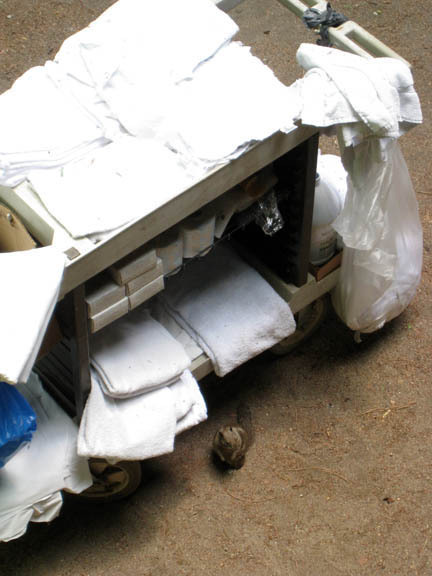 Park day three started with an early alarm buzzing in my ear. We didn’t know if we’d be able to hike Half Dome today or not. The night before we were both completely spent and knew we were not going to feel our best in the morning. Yosemite Falls was a “strenuous” 7-1/2 mile hike but doing Half Dome as a day hike would be a “very strenuous” 16 miler (for us actually 18 mile but more on that later). If we were going to do it at all we needed to be out the door by about 5am. The shuttles don’t run that early so we had to drive to one of the other campgrounds to park. Unfortunately, I misunderstood what the ranger was telling me the day before and we parked in the wrong lot which was at least a mile from the trailhead. I would curse this decision before the day was out. I was already weary and so convinced that I wasn’t going to hike the whole thing I didn’t bring any extra water and I left my gloves (needed for the final push) in the room. 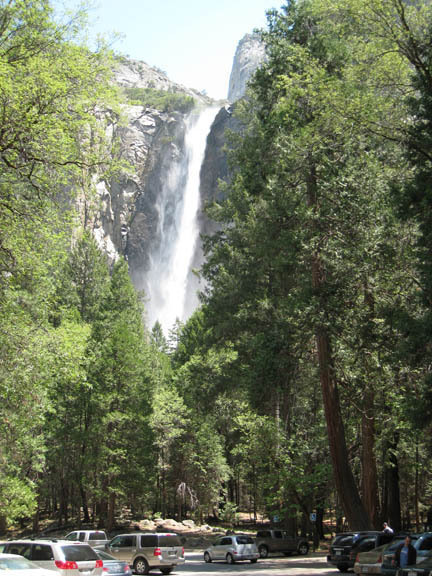 Our thought was to hike to Vernal Fall on the Mist Trail (supposed to be the best and most popular hike in the park). 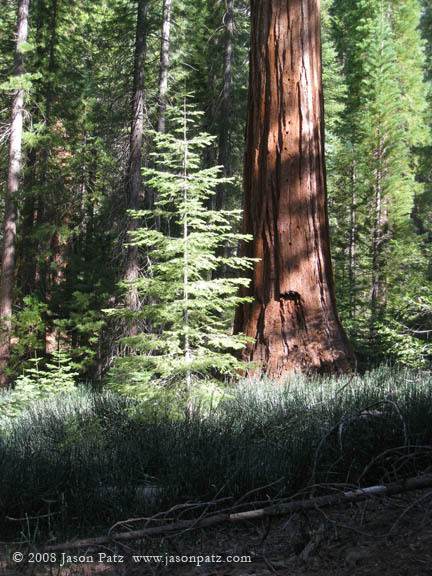 This would get us maybe a quarter of the way up to Half Dome and would be a fun little hike. As popular as this trail is I’m surprised at how steep it is. 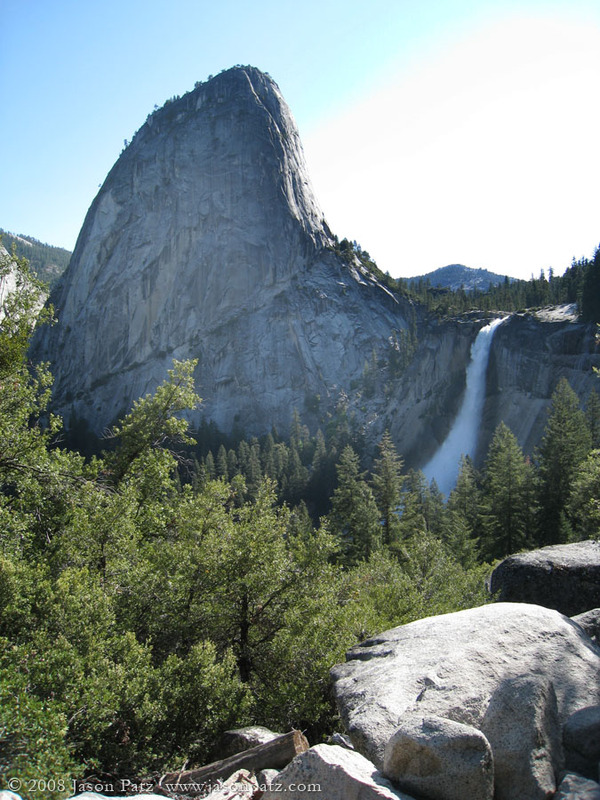 Nothing like Yosemite Falls but certainly enough to give a couch potato thoughts of cardiac arrest. One huge help is that this portion of the trail is paved making walking fast easy and soft underfoot. There are even bathrooms and water fountains along the way. We quickly reached the bottom of Vernal Fall which is quite beautiful. 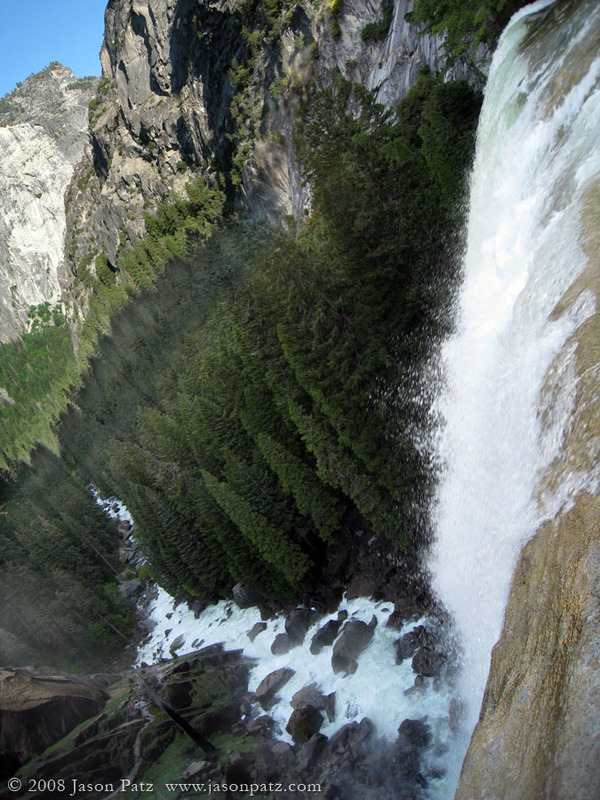 It is a nice change from Yosemite Falls because it is one free-leaping fall as opposed to Yose’s two steps. Again the temp dropped (and it was already a cold morning) and the pavement ended as we approached the fall. We donned our rain jackets and were thankful to have long pants. Sidebar: I had hoped that jogging pants would work like hiking pants so I wore them over my shorts. They kept me warmer but they got soaking wet anyway. 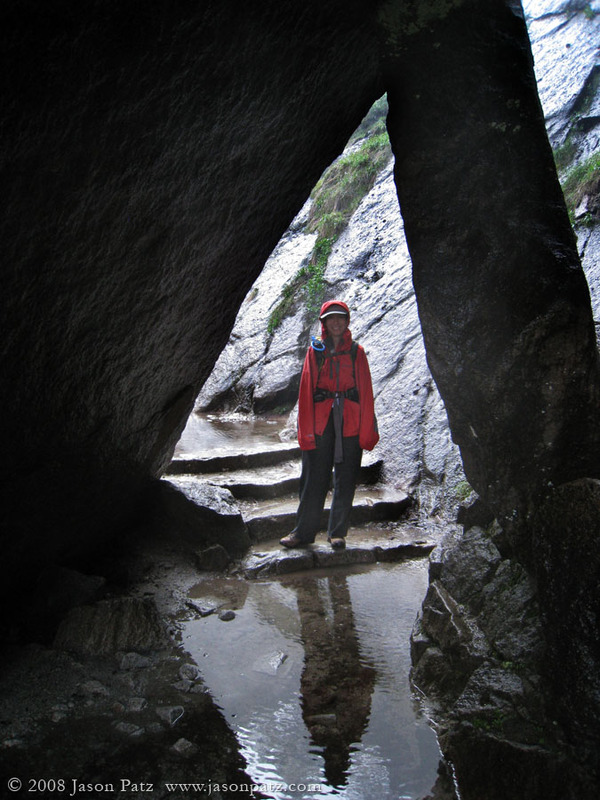 I will definitely get a pair of hiking pants if we are going to be in a wet situation like this again. Now it was time for the signature section of the Mist Trail. We would climb a staircase cut into granite that hugs very close to the side of the fall. Later we would find out that nature was aligned perfectly so the fall was at maximum force that day. 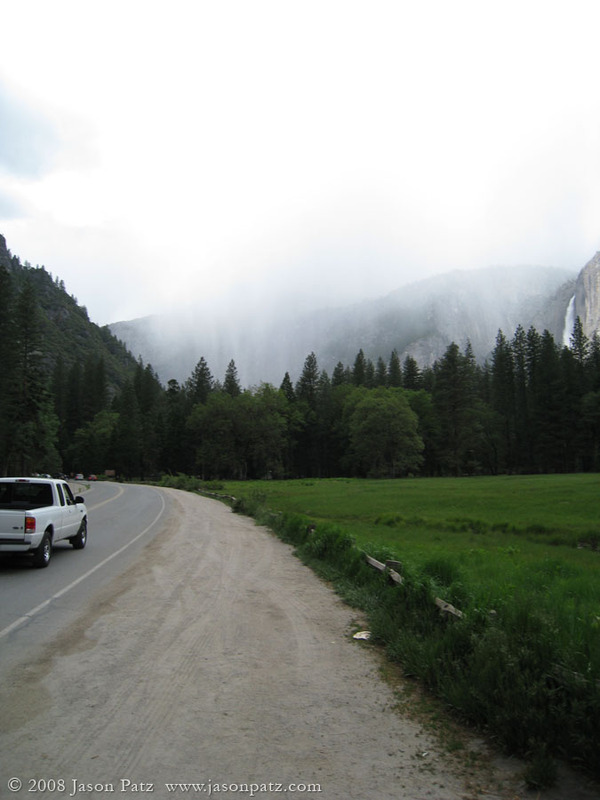 There were parts of the climb that were a driving “mist” that felt like someone was pointing a garden hose at us. I thought it was neat but Melanie wasn’t having as good of a time here. She doesn’t like to be cold or wet and she was both. Additionally some of the steps were almost waist high for her so she got a tremendous leg workout. 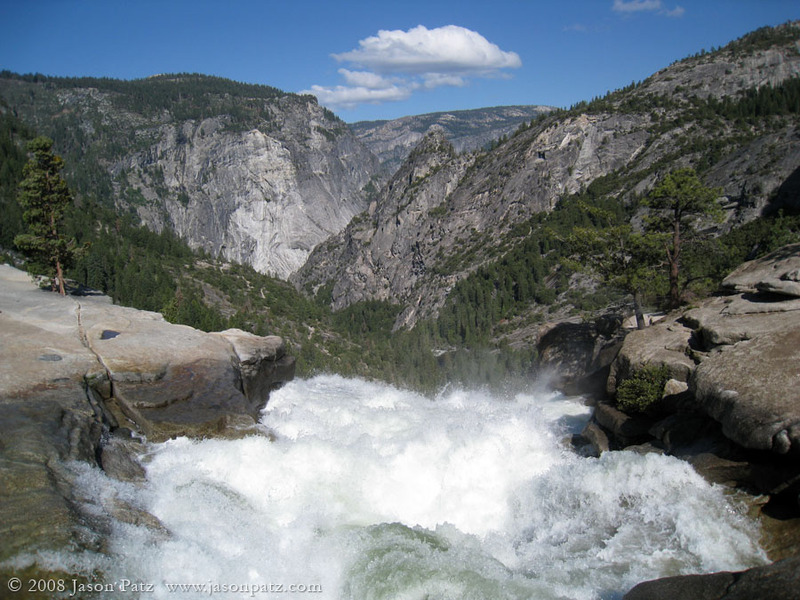 Once we reached the top of the stairs and the trail veered away from Vernal Fall we stopped on a big rock that was in the sun so Melanie could thaw out and I could strip down to shorts and T-shirt. We continued the climb to the last bathroom just past the top of Nevada Fall. It was at this point that we decided that we would make an attempt to hike Half Dome. Maybe the beauty and coolness of getting to walk over the top of Nevada Fall inspired us. I’m not sure. We had worked out the soreness from yesterday’s hike and were feeling pretty good. If we didn’t make it all the way, we would still get to see some nice scenery. As the hike continued we spent a mile or two in that soft granite sand again. Unlike before this wasn’t a problem at all because the trail was almost completely flat and wide open giving us some nice views. Next up were switchbacks in the trees that went on for a long time. As we continued to climb the wind gusts became more frequent and I had to put my fleece back on. We passed (and were passed by) several groups of people young and old from all over the world. We talked to a Korean couple when we stopped for lunch. There was a man from Taiwan that was retired and hiking this trail for the second time. We ran across a Vietnam vet (Army) and his wife. I picked out an Australian accent and one that was probably German. Around this time I ran out of water. Luckily for me Melanie still had a little more than half of hers left. We would have to ration it, but I hoped that I could make it the rest of the day without a bad headache. I knew I was in no danger of problems related to dehydration. I’d pounded down 2.5L already and if I got REALLY thirsty I could always put snow in my water bladder and treat it. Still I had to smile to myself. The biggest thing they caution on this trail is carrying enough water. If I had planned on hiking Half Dome from the start that morning I would have had at least 1L more (perfect) or 2L more (overkill). This may sound like a crazy swimming-pool-sized amount to you hiking pros, but I’ve noticed that I need more water than the average Joe. Keep in mind too that this was a tough all day high up a mountain in a very dry climate. I’m just lucky it wasn’t a hot day. The switchbacks went on for a very long time. I kept thinking we were going to get above the tree line any minute. I also knew that we had a couple miles hiking along the ridge of the area right below Half Dome before we actually got to the granite outcrop itself. When were we going to get to that flat part?! Finally we did but it still had a lot of trees. Eventually they thinned out until they were downright sparse. Half Dome was directly in front of us and if you looked closely you could see people working their way up the switchbacks on the side of it. What a feeling of accomplishment. What a feeling of freezing. It was getting relatively windy and much colder. Time for more clothing. When we reached the base where the switchbacks started there were many small clumps of people eating, relaxing and resting up for the rest of the climb. I’m guessing many camped in the higher meadow we passed on the way up. I can’t believe that all of them started that much earlier than us for a day hike. Once we had rested a couple minutes we decided to give it a try even though we didn’t have gloves. My muscles were very tired and this part of the trail was extremely narrow, steep, and uneven. It required a lot of leg strength and coordination. It is like the difference between squatting down quickly and doing it very slowly. Going slow is a lot more effort. Anyway, my balance isn’t so great anymore and I was tired so this was quite a challenge. Once we climbed above the trees on the ridge below the wind really started gusting. It was freezing cold and with every gust I felt like I was wearing a sail on my back or that some giant was grabbing me and twisting me or nudging me off balance. We kept climbing but at almost exactly the halfway point Melanie cried uncle which was definitely for the best. We worked our way back down the side of Half Dome and for about the 1st mile or so back down the mountain we were stopped by people we’d passed on the way up. They would have an excited look on their faces thinking that it was going to be a quick trip to the top from where they were. Once we told them we didn’t make it they would usually look concerned or surprised. The rest of the trip back down the mountain was uneventful with the density of people on the trail increasing with every step we took. 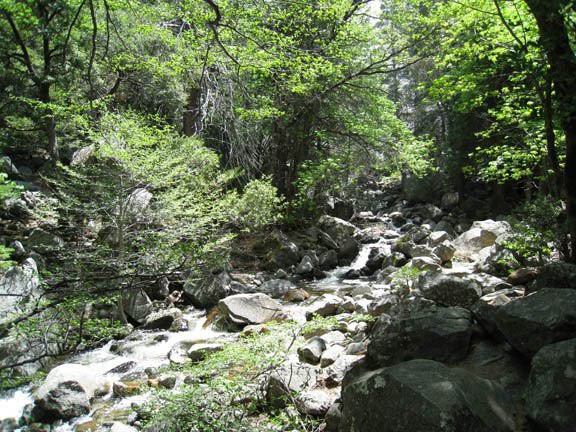 Overall it was a beautiful hike with spectacular and changing scenery. 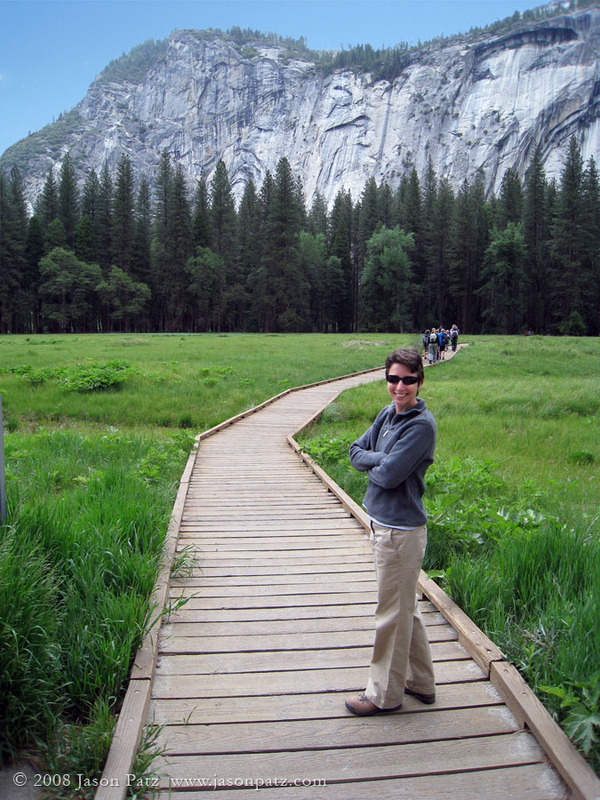 In Yosemite Valley I don’t believe there is a nicer hike and recommend the Mist Trail to Vernal Fall to everyone. For those in good shape, continuing on to Half Dome is very rewarding. 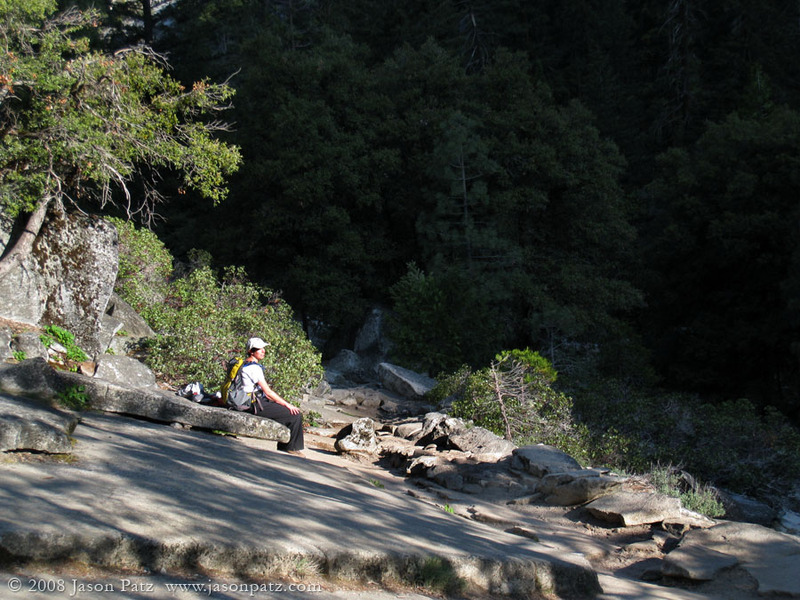 Even though it used up more of our energy reserves, I think this hike is less strenuous than the Yosemite Falls trail. Needless to say we had a big dinner that night and I ate two breakfasts the next morning. What was weird was that even after a pancake breakfast (including eggs, bacon, etc) and an egg, hash brown n’ more breakfast I didn’t feel stuffed. Just pleasantly full. Sidebar: I forgot to mention that the day before we also stopped to see Bridalveil Fall on our way back from Glacier Point. This is a really tall single fall and quite beautiful. 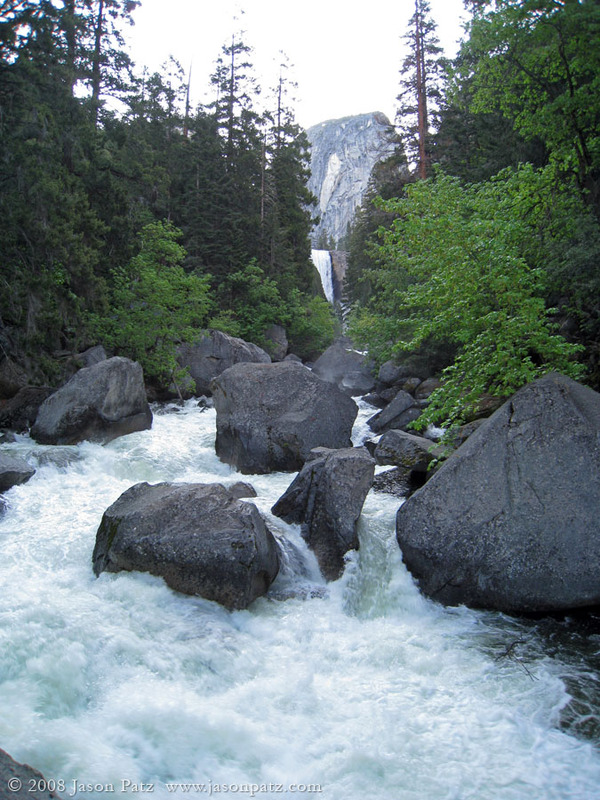 It is exceptional because it is one of the only waterfalls in the park the flows year round. After checking out of the lodge we decided to give Yosemite Falls another quick peek. We were surprised to find that the water flow had decreased significantly since the beginning of the week. We were so happy that we visited when we did. All week we had been hiking and driving by these cool looking wooden elevated paths across the delicate still-developing fields in the valley and decided to see where they lead. They didn’t really go anywhere and it was a really short walk but really cool experience. If I had a house on the marshes around here I’d want something like this to stroll around on. Then it was time to get back in the rented Hundai (a surprisingly nice car) and head for civilization. It started raining which turned to snow flurries as we climbed out of the valley. Traffic was much heavier on the other side of the road between the park and the interstate. It was approaching bumper to bumper as folks worked to pack the park for a Memorial Day frenzy.